HAPPY SUMMER! Well almost. I can’t believe it’s already June! In less than a month Summer Break officially starts for us, and Oh Boy! do we have a busy summer ahead! Along with our other summer plans (I can’t wait to tell you all about it- but not just yet! ), I wanted to be intentional about doing some fun family activities together with my guys. So I decided to make a Summer Bucket List again! I was originally inspired by my friend Becky (from Star Wars Wife) because she always has such fun ideas and great adventures with her beautiful family during the summer! My last attempt at a Summer Bucket List was 2 years ago (check it out here! ), and we got close to doing almost all of our activities! We had so much fun checking off our “list”! My personal favorites were “Riding our bikes across the Golden Gate Bridge” and “Visiting the New Exploratorium”! 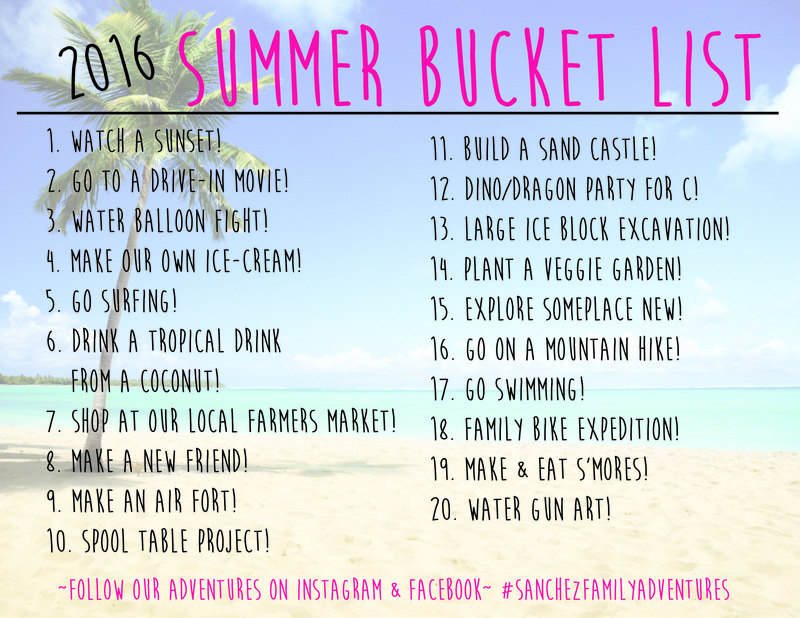 I love the idea of a Summer Bucket List because it offers your family a plethora of ideas and great activities to GO out and DO, rather than just sit in front of the TV all summer long. Plus, everyone gets to do something that they want to do! So, I asked my guys to tell me what activities they wanted to do, and together we came up with 20 fun adventures to have this summer (see it below!) I’m really excited to check all of them off of our list this year! Happy Adventuring! If you want to follow along with our adventures this summer, I will be doing my best to share photos on Instagram and Facebook using the hashtag #SANCHEZFAMILYADVENTURES.